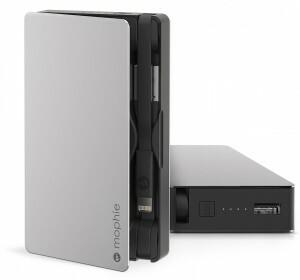 The mophie powerstation plus line-up incorporates compact design, integrated charge and sync cables and universal compatibility making charging on the go easier than ever. Industry-leading battery life enables our products to hold their charge for an extended period of time, making them more reliable than other external batteries. Smart charging circuitry always provides your device with the perfect amount of power for a safe, quick charge. Integrated Lightning or micro USB cable makes charging and syncing your device easy and eliminates the need for additional cables. Charge your mobile devices faster than ever. All powerstation plus models charge devices at speeds up to 2.4A. That is 2-4 times faster than typical smartphone chargers. Charge a power-hungry tablet from 0% to 100% in as little as six hours. Enables pass-through charge and sync while connected to a computer. Power is sent to your device first, then the powerstation plus unit recharges itself.